Lodging Rates are based on accommodations requested, dates needed, and other considerations. All rates are subject to change at any time without notice. See our Promotions page for current specials. We are not able to offer any discounts during Peak dates due to our frequent waiting lists for peak dates. Non-Peak dates, however, are periodically discounted with additional savings or other incentives. All rates are per day, not per night, and full rate applies for all accommodations regardless of check-in time (i.e., if you check in during the afternoon or evening, we still invoice for a full day, just like at a hotel. Deposits are required for any lodging dates with us. Deposits for cancellations with 10 days notice, or more, will be credited for your next lodging or grooming visit, no refunds. Emergency cancellations will be taken under advisement depending on the situation and clients standing. AM Check-out time Mon — Fri is 10:00 am to avoid additional fees for that last day of lodging. Sat 8-10 am and Sun 3-5 pm ONLY. Deposits are required for any lodging dates with us. Deposits for cancellations with 10 days notice or more, will be credited for your next lodging or grooming visit, no refunds. Emergency cancellations will be taken under advisement depending on the situation and clients standing. Any refunds potentially offered require $20 fee for staff time to try and fill the spot and process payment. As of Sept 2012, we now request payment be made at Check-In time for lodging pets, and we accept cash, checks, Visa, MasterCard, and Discover. Returned check fee is $50. We also offer "Lay Away" for any customers that would like to pay down the balance of an upcoming trip in advance, at no extra charge or fees to you. This is sometimes helpful for families with multiple pets, extended visits, or otherwise anticipated larger invoices. Feel free to call us with any questions or comments. $60 per day for 1 pet, $30 per day each additional pet (Effective September 2014): Available by the day and overnight or long-term lodging. 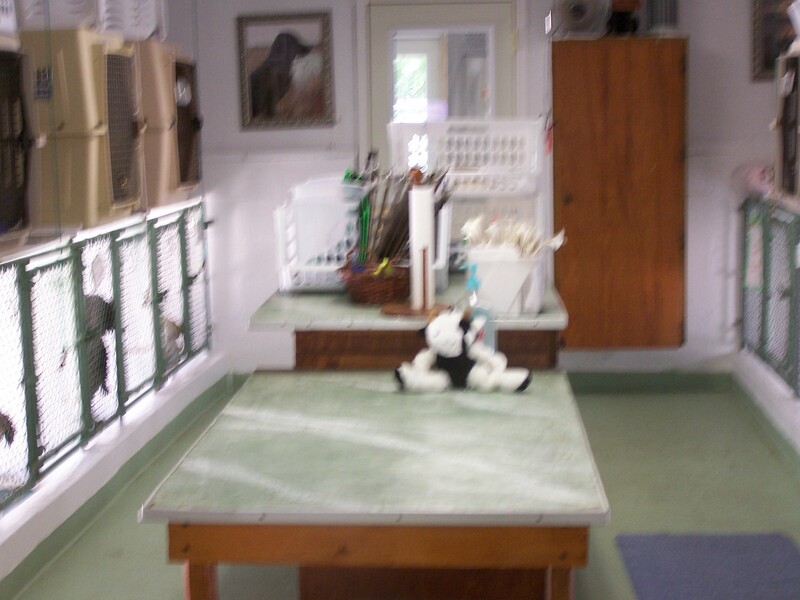 Includes two comp Staff visits per day in addition to regular cleaning, feeding, and socializing visits morning to night. Cabins include private play yard with indoor-outdoor doggie door, individual heat/ac unit, private kiddie pool in warmer months, and deluxe bedding options to name a few perks. 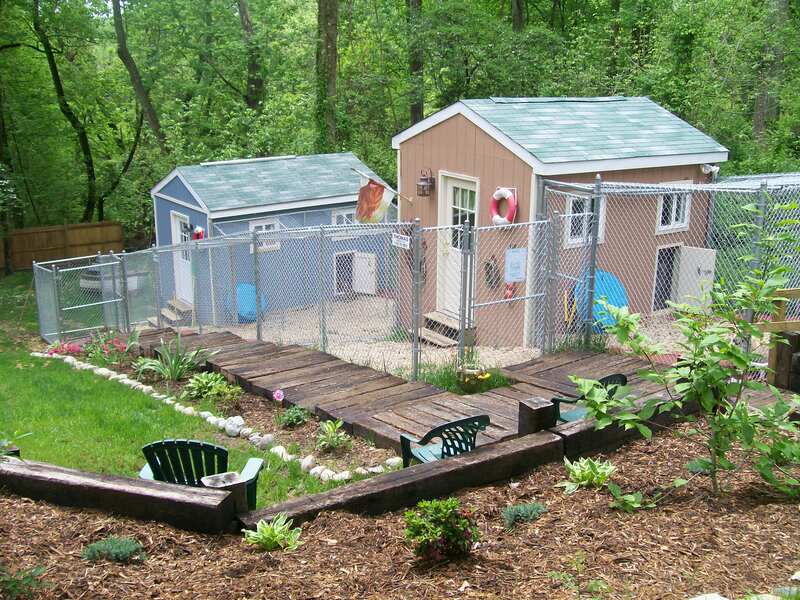 Outdoor pet access 7 am — late evening daily, weather permitting with their individual doggie door, plus 3-4 additional outdoor play yard times every day with staff. Group playtime with other dogs may also be added as an "Extra." Available for overnight or long-term lodging. Includes individual private kiddie pool in their own run during warmer months, ample clean bedding and linens, Snacks after every outdoor time included and at bedtime tuck-in. Pedigree dry food included, or bring your food of choice in pre-labeled zipper bags per meal. Current clients will be invoiced at their current rate. $20 per day per pet (As of March 2014): by appointment 7am — 7pm Mondays through Fridays, based on available space during peak dates. 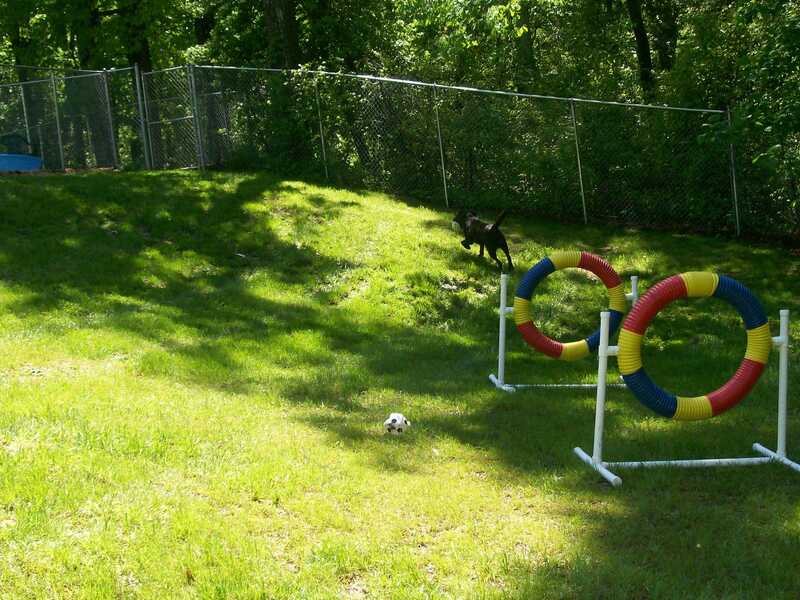 Two daily options include “Group Play Daycare” or “Day Lodging.” Pets of suitable temperament and friendly disposition are invited to participate in up to two outdoor play groups daily with other play group pets (big dog, small dog/puppies, or senior groups), or individual play time with staff, in addition to multiple outdoor potty breaks. Play group pets must be altered and of friendly and stable personalities, and at our discretion at any time for safety. Nap time and quiet times are provided in our indoor-outdoor patio runs and/or size appropriate Indoor Enclosures (size small to extra large), according to available space on any given day. $25 per day Standard Condo, $30 per day Extra Large Condo (Effective September 2014), includes use of our 3-story kitty condo, fresh bedding, and premium scoopable litter. 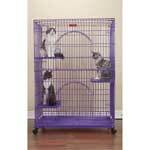 Stock dry food and treats included or bring your food of choice. Kitties are allowed to romp around our play room, individually or with feline family members, at least once a day to stretch and investigate, or rest in the window cat seat. Minimum $20 per day and up; requires prior approval and current applicable vaccinations and health requirements. 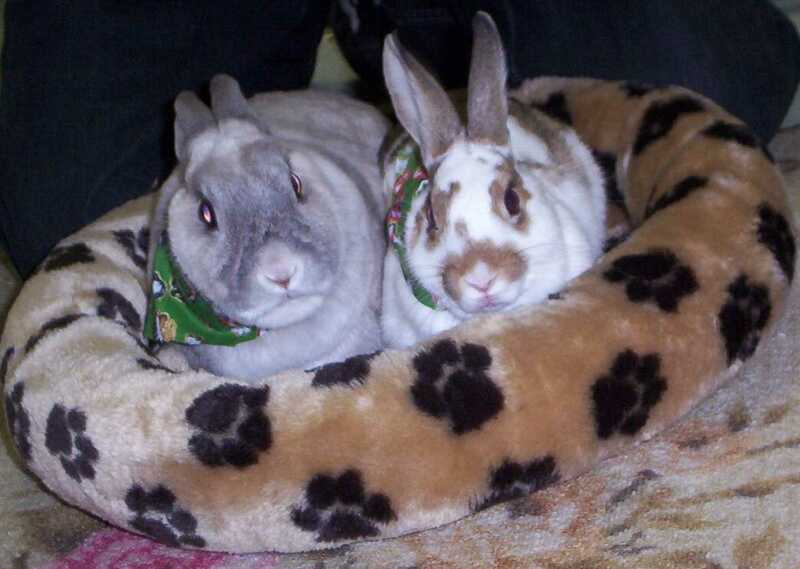 Owner may be asked to bring any special enclosures/cages, bedding, food, etc, as needed. Medications for friendly pets start at $5 per time (per set of 1-3 pills pre-labled and packaged from home in baggies/pill boxes with date and time needed), for pets that easily take their medications. Ear and eye medications and treatments are $5-$10 per time for 1 or both eyes or ears, depending on time/complexity required, amount of cleaning of the area first, etc. Medications from home should be sorted into individual baggies or in a pill box labled with your pet's name and the date and time needed for each pet on each baggie or pill box slot. We still need the original containers to accompany your pet's sorted meds, in case of any emergency where we would need to identify the medication specifically. As you can imagine, 20-40 or more pets on-site at any given time requiring medication, requires significant amounts of specialized Staff time to complete with accuracy and proficiency. Please assist us by pre-sorting your meds and home and providing pre-written index card brief instructions on which pet needs what at what time and what the medication, pill, vitamin, etc is for. If we need to sort and organize your medications at check-in, we do charge a minimum of $10 at that time. If your pet is difficult to administer medication to, or requires a significant number of medications or specialized medical treatments, we suggest boarding with your Veterinarian. Pets that need insulin require pre-approval and fees range from $10 - $20 per time, depending on pet's willingness to take the injection, and/or special pre-feeding requirements or handling prior to the innoculation. Owner must provide all the needles and insulin, as well as extra needles and insulin in case of emergency. Additional fees will be necessary if additional staff or resources are necessary to insure your pet receives their insulin and/or pre-insulin required meal. We do have a refridgerator on-site for the insulin. Complicated food preparation or feeding requiring special instructions, storage, or preparations, beyond adding water or canned/packaged food, will be charged additional fees. We are able to provide cold storage, or freezer accomodations based on available space. A microwave is also available to heat food as needed. We accept cash, checks, Visa, MasterCard, and Discover. Checks require two forms of ID, including one photo ID. Returned check fee is $50. We also offer "Lay Away" for any customers that would like to pay down the balance of an upcoming trip, at no extra charge or fees to you. This is sometimes helpful for families with multiple pets, extended visits, or otherwise anticipated larger invoices. Feel free to call us with any questions or comments. Please call us at 301-373-3400 to speak with a reservation specialist, or e-mail us at wecare@chessiepets.com for additional information, available dates, and current lodging rates.